Dr Antonia Tzemanaki is a Research Fellow at the Bristol Robotics Laboratory, UK working on developing and testing novel instruments and intuitive human-robot interaction systems for wearable robot-assisted minimally invasive surgery. She holds a MEng degree in Electrical and Computer Engineering from the Aristotle University of Thessaloniki, Greece, an MSc in Robotics from the University of the West of England, Bristol, UK and a PhD in Medical Robotics from the University of the West of England and the Bristol Robotics Laboratory, UK. During her PhD at the Bristol Robotics Laboratory, she has collaborated with surgeons on developing the ‘μAngelo’ surgical system aiming at natural manipulation for improving dexterity and ergonomics in surgical procedures. She is currently the main researcher on ‘SMARTsurg’, an H2020 funded EU project, with a goal to promote dexterity and ergonomics in soft tissue robot-assisted surgery. 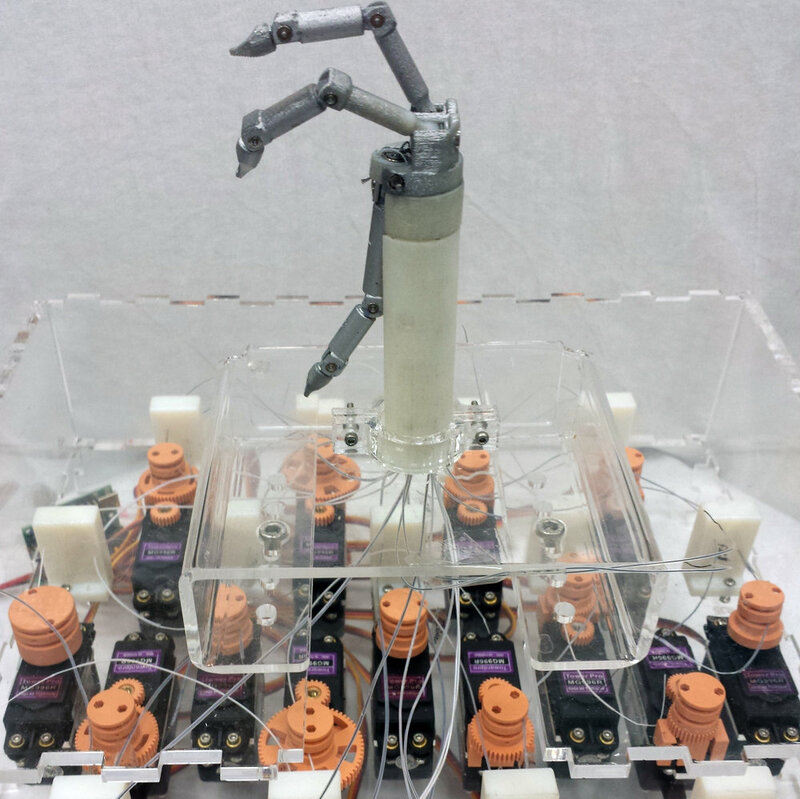 Previous work includes robot fingers and hand rehabilitation robotics for stroke and sport injury patients. I am a research fellow at the Bristol Robotics Laboratory, in Bristol, UK, a role that is mainly based on research although I mentor and supervise postgraduate students during their dissertations as well. My research focuses on Medical Robotics, in the centre of which is SMARTsurg project which includes 10 institutions from around Europe and is funded by the European Commission H2020 programme. SMARTsurg stands for SMart wearAble Robotic Teleoperated surgery and aims to develop an advanced system for robot-assisted minimally invasive surgery that reduces the surgeon’s cognitive load related to the system’s operation, shortens training time and delivers accuracy, reduced procedure time and safety. An important goal is to expand applicability of robot-assisted surgery techniques to complex procedures which are now performed with open surgery. The project focuses on three areas: a) vision, with wearable smart glasses for the surgeon and the surgical assistant, implementing active constraints to restrict the instruments to safe regions as well as virtual reality augmentation, b) dexterous instruments with multiple degrees of freedom that enhance efficiency and reach in the operating field wearable and c) wearable robotic hand exoskeletons with haptics for tele-operated control of the surgical instruments. After completing my MEng in Electrical and Computer Engineering, I was not sure what I wanted to do and hence, I decided to study for a little longer. I went on to do a MSc in Robotics and following that got into academia and research and finally completed my PhD in Medical Robotics. One of the challenges was, as a young engineering graduate, to decide where and on what I wanted to work, especially since I could not see many women professors or women heads of companies/entrepreneurs. I was fortunate, however, to have a lot of support from my family. Nowadays, the biggest challenge is to gain funding to continue my research as well as to keep a good work-life balance. What does the #WomenInTech movement mean to you? What are the challenges of being an entrepreneur and woman in STEM and IoT industry? The #WomenInTech movement was exactly what I would have needed as a young engineer and it is what I believe will change the STEM field for the better. We need diversity and we need more women and other minority groups to be confident enough to join their strengths with us. Research for novel solutions to problems that can transform society is very exciting and fulfilling to me. Investigating and developing a novel system for robot-assisted surgery during my PhD studies was an achievement I am very proud of as it included a lot of hard work and collaborations with many surgeons and other researchers. In the words of Arthur C. Clarke, “I have loved and I have learned” and I am hoping to keep doing that. I am also very proud to be organising the local Women In Robotics group (@WirBristol), a support network for women that are working or are interested in robotics. We promote networking as well as the visibility of women and their work in robotics. We are part of the worldwide network of women in robotics. In your opinion, what will be the key trends in the IoT and robotics industry in the next 5 years and where do you see it heading? I see medical robotics in its many forms, surgery, stroke and injury rehabilitation and assisted living for the elderly among others, being at the centre. The span of our lives has increased and while 17.4% of the population was 65 years of age or over in 2010, this number is projected to rise to 29.5% by 2060. Estimated costs of such an increasing population indicate an enormous economic burden, which could be tackled with advancements in robotics. The goal is to support surgeons, medical staff, care givers etc. by adding to their skills as well as unburdening them from menial tasks, while enhancing the life of patients and others in need. What is the most important piece of advice you can give to all female founders and female entrepreneurs in STEM out there? They should persist against all odds and join women’s networks for support, reach out to them to ask for advice. They should not let anyone tell them that what they want to do is not for them. I know I had been told that engineering is not for girls. Luckily, I saw it as a challenge or, maybe, a rebellion against the norm. Finally, we all need to step up and be role models for younger generations. Who are your 3 inspirational women in IoT and robotics industries? There are so many! I am inspired and motivated by all women that I see being daring and chasing their dreams. Marissa Mayer, Allison Okamura, Simone Giertz. Since a young age, I have adored science fiction and one of my role models, although fictional, was the character of Dr Susan Calvin who appears in so many of Isaac Asimov’s stories. My supervisors Zoe Dougeri and Sanja Dogramadzi were proof that ‘Susans’ exist.